Many state independent deadlines have passed. His Facebook page describes his plan: "Standing up to run for president because it’s never too late to do the right thing." But an independent run, at this point in the calendar year, would be a little too late, Roll Call finds. 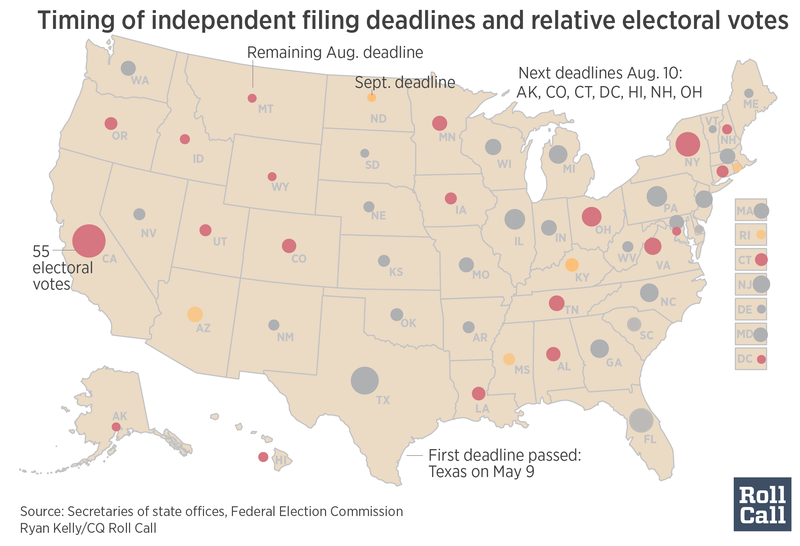 Many state filing deadlines for independent presidential candidates to appear on state ballots have already passed. In fact, the number of states that have put such deadlines in the rearview mirror now amount to a majority of electoral college votes. McMullin, in a series of Facebook posts last week, appears at odds with Trump over his comments on Muslims and specifically the Khan family that spoke at the Democratic National Convention. "As someone who served our nation in war, I find Donald Trump&apos;s religious attacks on Ghazala Khan, the mother of a fallen U.S. soldier, profoundly despicable. Her son gave everything for our country and she, like thousands of other American mothers, has also made a painful lifelong sacrifice. No one who fails to understand this is fit to be our commander-in-chief," McMullin posted on his personal Facebook on August 1.